Queer, from its start, was meant to point beyond or beside identity—specifically gay and lesbian—and instead signify transgression of, resistance to, or exclusion from normativity, especially but not exclusively heteronormativity. But for all this, queer has never quite moved beyond identity. And queer has not quite been the site of resistance we had hoped, as the story of queer studies’ academic institutionalization might portend. Still, I am not writing a eulogy for queer. 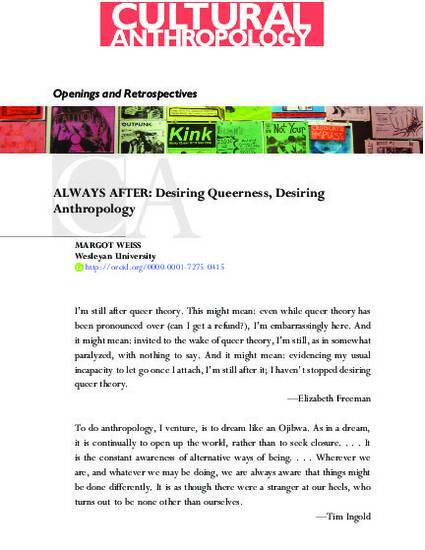 Instead, in this Retrospectives essay, I resist finding—if only to lose—a new proper object of queer anthropology and suggest, rather, that it is the frustration of the desires we invest in our objects that makes for a queer anthropology—and that makes anthropology queer. I also refuse to offer a next/new/now queer anthropology—our future, our new vanguard. Instead I return to a past that, I suggest, we are not after, in the sense of over, in order to flesh out what it is we are after, in the sense of desiring. I locate these dynamics first in queer anthropology’s move away from identity, then in its turn from antinormativity, and finally in the future-facing queer of speculation or possibility (what I call desire) that marks much recent work. But while I proceed linearly, I do not want to provide a progressive timeline, where we reject identity for antinormativity, antinormativity for desire, and so on, each new turn moving us out of intellectual naïveté toward a new and better queer. Instead, I argue that these three concepts—identity, normativity, and desire—are constitutive tensions in the past, present, and future of queer anthropology. They are our stumbling blocks and our goads, the limits that beg to be transgressed; they are, in the end, incitements to a queerer anthropology, an anthropology that keeps us queer.